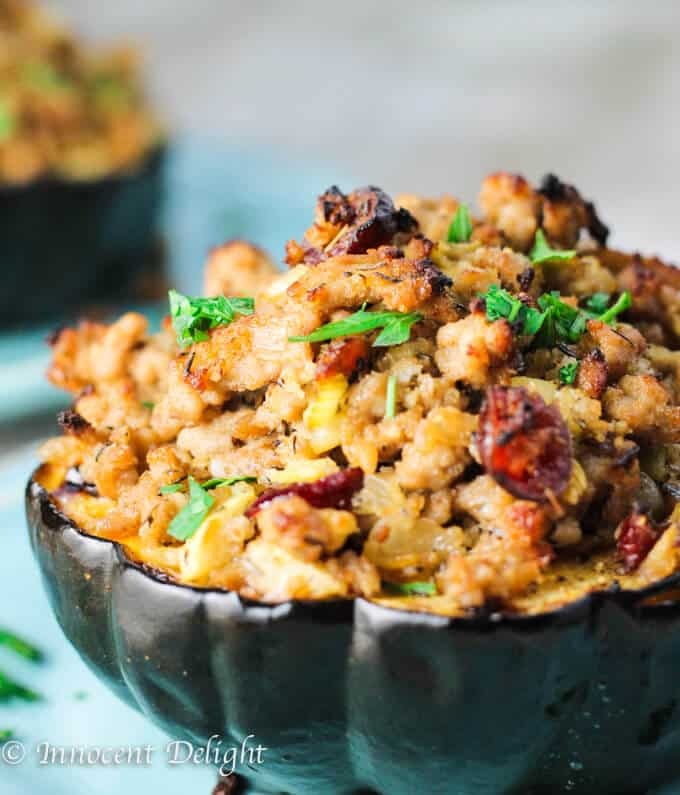 Turkey Stuffed Acorn Squash – it’s a Fall on a plate (affiliate link); Turkey with Apples, Cranberries and dried Thyme stuffed in a sweet Acorn Squash makes for irresistible combination of fall flavors. Ok, so that’s not by any means European dish. It screams American and actually screams: American fall. I love all the flavors of this season: pumpkins, squashes, apple sider, turkey etc. 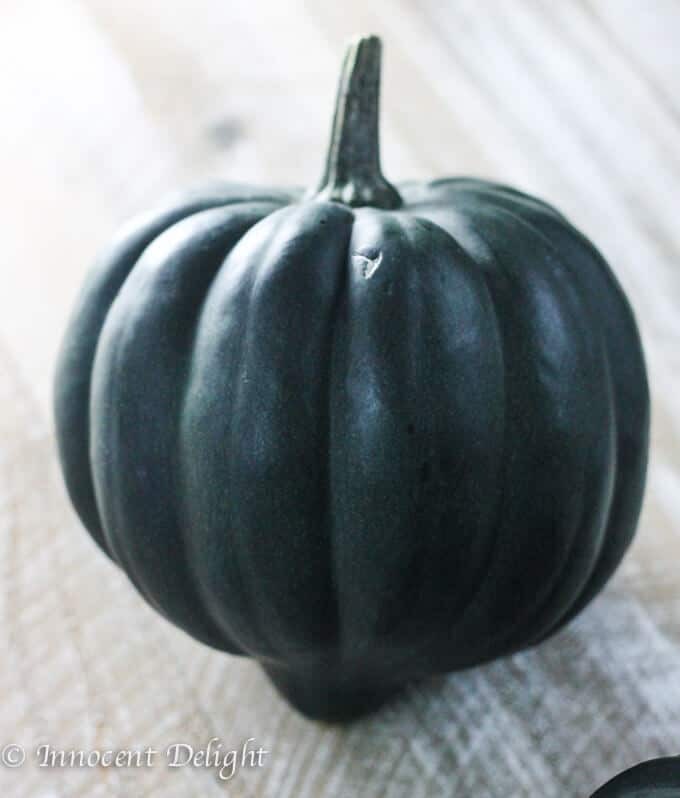 Even though I am trying to share my heritage on this blog, I cannot simply disregard this wonderful season and not share something that I developed and it’s out of this world – my Turkey Stuffed Acorn Squash. Few weeks ago we drove to the east of Long Island to spend half a day on the farms, get a pumpkin, apples and whatever else we could have found. Our aunt, who lives around there and knows me and my unconditinal love for fresh, good quality food, had the entire itinerary for us. First stop on her list was a huge farm stand. You could get there anything you wanted. So, we all got separated. Everyone went to buy their own produce and when we met by the car, I was asked what did I get. 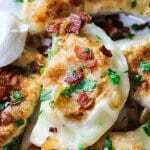 I simply replied: everything… I mean everything: white cabbage, red cabbage, cauliflower, leeks, potatoes, tomatoes, brussels sprouts, different kinds of squashes…. etc. I cannot even remember what else was in my basket. But one of the squashes was the Acorn Squash. I’m very comfortable with Butternut Squash. 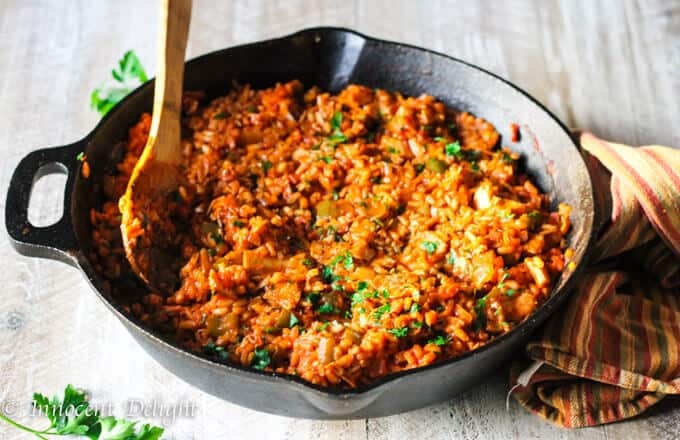 I absolutely love it and cook it often. 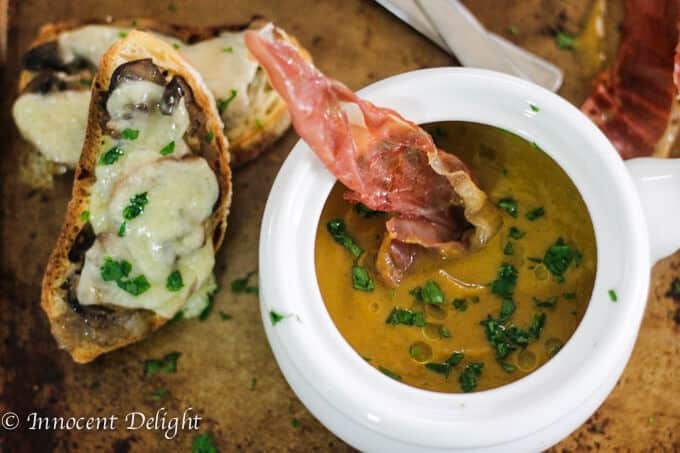 You can check one of my favorites butternut squash recipes: Truffled Butternut Squash and Mushroom Soup. or Roasted Butternut Squash Feta Pierogi. I have never cooked with Acorn Squash, though. Except for summer squashes, like zucchinis, the winter squashes are not very popular in Poland. Maybe they are right now, but for sure I did not know them when I was growing up. And because I do love trying new things and pushing my comfortable buttons, I decided to tackle this amazing vegetable (or should I said fruit, as it technically is fruit because of its seeds). I knew I could roast it and I knew I could stuff it. That’s how my Turkey Stuffed Acorn Squash was born. 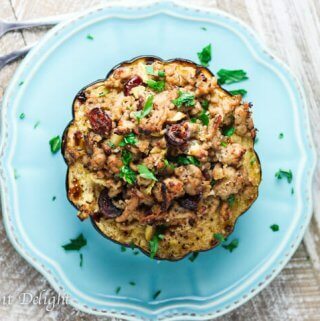 One night I told my husband that I wanted to make this squash, stuffed with turkey. It didn’t resonate well with him. He told me that, “again, I am turning him into vegan”. The fact that it was filled with meat didn’t matter. What was important is that I was serving the WHOLE veggie for him and this were supposed to be a star of the night. Even though he likes to complaint about vegetables, I usually do what I have planed to do. So, I served it. He took the first bite. And there was a silence. And then he looked at me and said: “do never do that to me again…and that’s all I’m gonna say”. He was simply speechless. That’s how amazing my Turkey Stuffed Acorn Squash was. Ever since this dinner, my husband kept telling me: “you need to put it on the blog”, “you need to put it on the blog”. 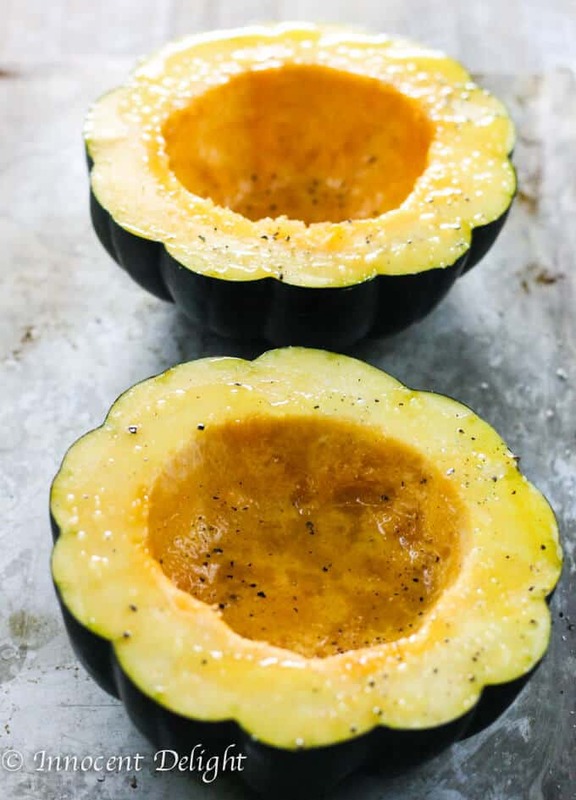 And this weekend, he said it again, “please make this acorn squash dish and post it”. It’s AMAZING and the season is here. So, here we come. It was our dinner last night and it was pretty spectacular. It takes some time, just because the squash needs to roast, but it is very simple. Once you cut the squash and remove the seeds, it needs to be brushed with olive oil, seasoned and baked for an hour. In the meantime, you need to make the stuffing. Season with salt and pepper and wait for your squash to be done roasting. 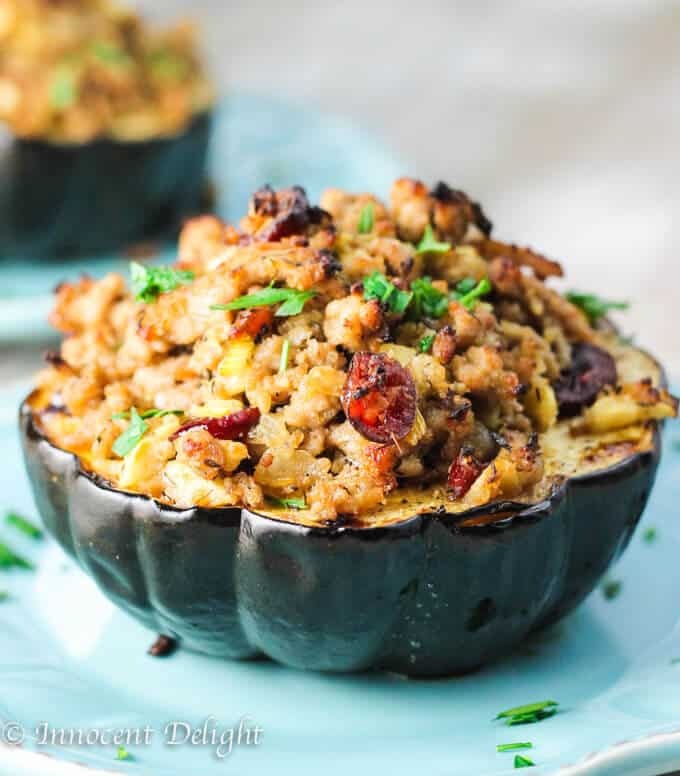 If you want to make this recipe vegetarian, replace turkey with quinoa or with lentils like I did in this recipe for Lentils Stuffed Acorn Squash. 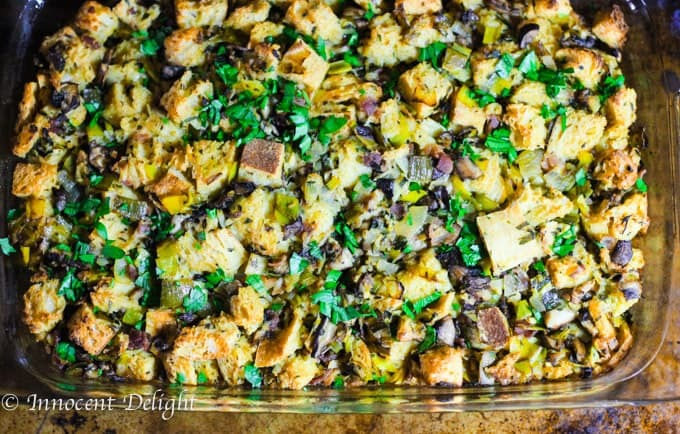 If you want to make this recipe vegan, replace turkey with quinoa or lentils and omit cheese. 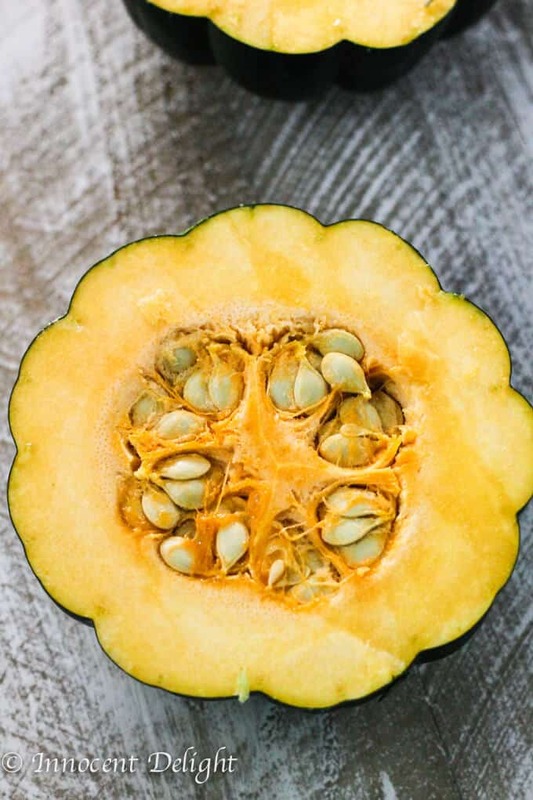 For more amazing squash recipes check my Ultimate Guide to Most Popular Winter Squashes. 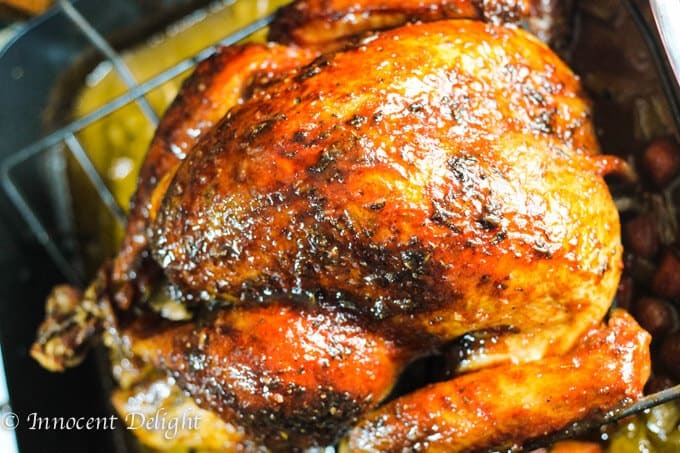 and for more ideas for Thanksgiving dinner check My Favorite Thanksgiving Recipes. This post was originally published on November 8, 2015 but because it so popular and the season for squash is back I decided to update it and bring it back to live. 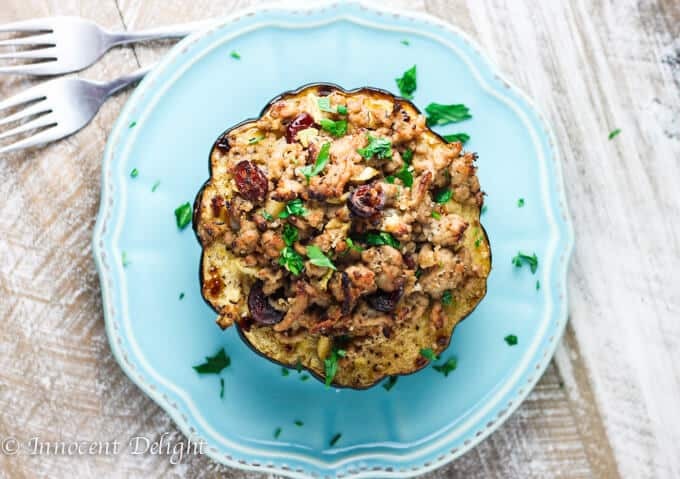 Turkey Stuffed Acorn Squash - it's a Fall on a plate; Turkey with Apples, Cranberries and dried Thyme stuffed in a sweet Acorn Squash makes for irresistible combination of fall flavors. I used one big Acorn Squash and I ended up with a little bit of meat stuffing left out. If you have smaller squash you may want o use 2 small once instead of one big squash. This is just gorgeous! Love all of the flavors in here! Anyway, Would it be okay to omit breadcrumbs next time I make this? do you scoop out any of the squash to mix with the meat before baking again? I don’t. The flush will be very soft and when you put it on the fork, it will take some of the meet mixture with the flush. It’s super delicious! Do you think fresh cranberries instead of dried would be good? I’m not sure fresh will do the same work as the dried ones are sweeter. You can try but I cannot guarantee that the taste will be the same. I made this tonight, super yummy!! 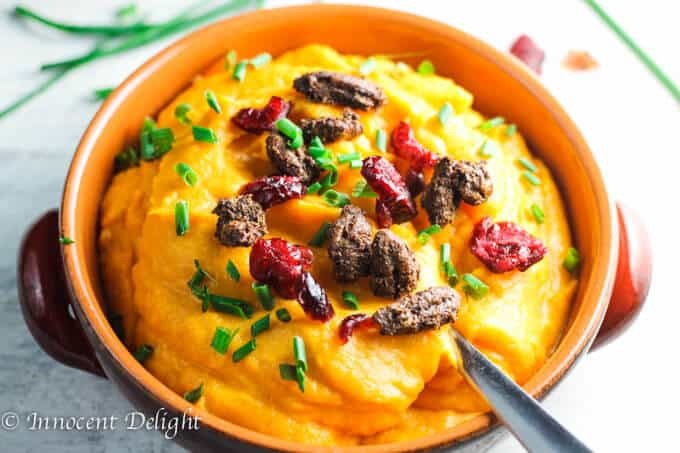 The dried cranberries make this dish! I made with a leftover rotisserie chicken. Since I obviously didn`t have to cook turkey I sauteed the onion first but added the apple right away. I had to omit the thyme as I didn`t have it on hand. I used 1 squash which was pretty regular-sized and I wished it had more flesh to it. Half of a squash is a great portion size. The bread crumbs don`t seem to be necessary but I liked them as they added nice texture. I could see adding almond slivers as well. 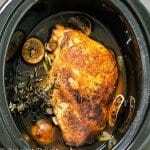 Thanks for a great recipe, I will make this again! Great, I’m happy to hear this Maggie. When I told my husband this was for dinner, he was less than enthusiastic. He’s not a fan of acorn squash. I made it anyways because I love squash and the pictures looked amazing. I’m happy to report that this tastes just as good with turkey breakfast sausage. We also had a little leftover stuffing in the skillet which my husband ate with a spoon. Any idea of the calories? I have it on my list for tomorrow to make. Thank you. It looks yummy. Not sure about calories. I am not a nutritionist and asa food bigger I don’t think privileged to provide this kind of information. I’m sure there is plenty of website that can help you out with counting the calories. Your pictures are beautiful, and this looks so yummy! Oh wow, this just screams autumn! 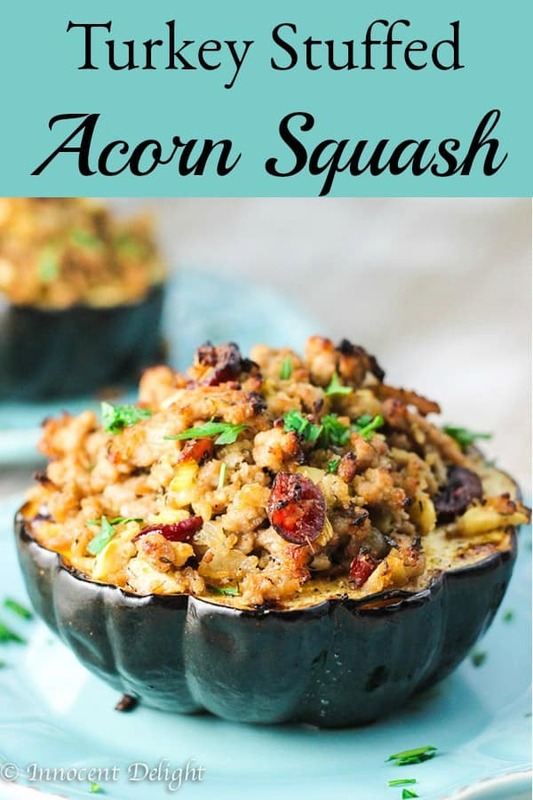 I am so excited for squash season and this looks like a great way to use them. Thanks Natalie. Let me know how you liked it. It’s freezing here in Scotland, so Autumn is definitely on it’s way. The perfect time to indulge in a few squash recipes. 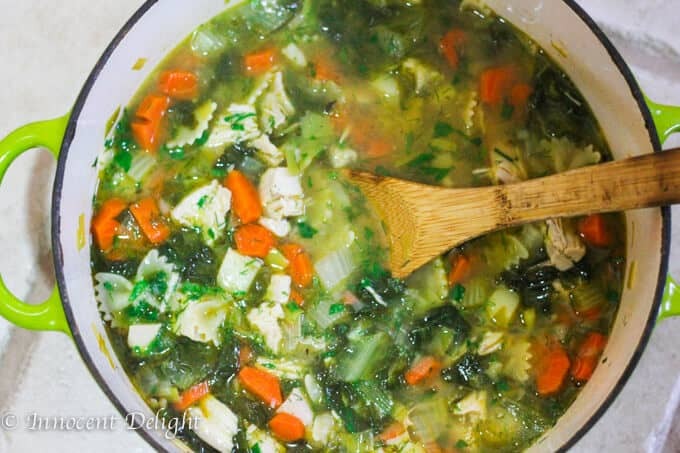 Oh my… We are not freezing yet here in NY 🙂 I’m pretty sure it will come quick and I will be making this dish all the time. How yummy! I know my husband will love this recipe. Pinning for later. Could you use breakfast sausage instead of turkey? Breakfast sausage is cooked so it will have a different flavor, but you can try. I think that raw sausage would work great. You will just have to remove it from the casings and follow the rest of the recipe. Be careful with the seasoning though as the sausage is already seasoned. This looks delicious and I intend to try it. 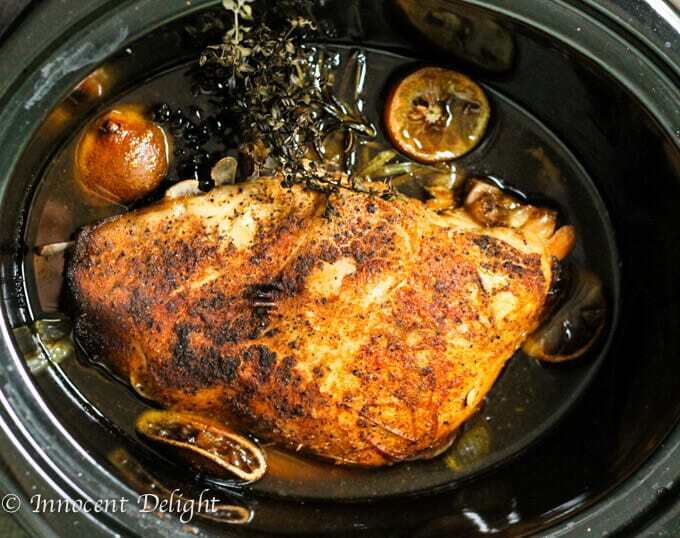 However, if you used dried thyme, what is the bright green herb leaves in it and on the plate in the photos? Hi Renidea, that’s just a garnish :). I used some finely chopped parsley. 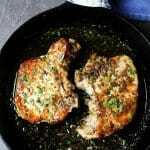 This is one of our favorite recipes. My husband drools everytime I make it. I was wondering if there was a way to convert it to a casserole to bring to a potluck?